At its downtown Toronto stadium, Rogers is tackling a serious challenge: how to deliver faster, more reliable wireless internet to the masses under less-than-perfect conditions. The Rogers Centre is an ideal laboratory. On any given night, thousands of smartphone users stream into the stadium, placing heavy demand on the wireless network. Plus, the venue’s concrete walls pose a barrier to signal penetration. Small cells help immensely. Look carefully and you can pick out one of 88 either mounted above the nosebleed seats or scattered throughout the rest of the stadium. Small cells are low-powered radio access nodes that help provide more capacity for overburdened cellular networks. In practical terms, they make it easier for stadium goers to upload a selfie or stream a video replay. Their role is set to grow in the coming years as telecom firms worldwide spend billions on current networks and new technologies to prepare for the next era of wireless service – one that relies on dense networks of small cells. Better known as 5G, the fifth generation of wireless networks will allow new innovations to flourish and dramatically change our day-to-day lives. Think driverless cars, smart-city traffic controls and more sophisticated industrial automation. Billions of new connected devices will come online in the next decade. They’ll need to transmit significantly more data and do so reliably. But today’s wireless networks are not up to the task. Canadian LTE (4G) networks already support fast downloads and easy streaming of content. But standard speeds and bandwidth capacity need to be much higher, while latency – the time it takes to send a signal from one point to the next – must be virtually nonexistent. To help make this possible, 5G technology will use new frequencies of spectrum, the radio waves that are used to carry cellular signals. Current networks use low- and medium-band spectrum, with wavelengths in the range of up to half a metre. Low-band radio waves can travel long distances and penetrate buildings, making them highly prized by carriers looking to offer reliable coverage. But low-band spectrum can’t carry as much data as higher-frequency waves. That’s why 5G networks will also use so-called millimetre-wave spectrum, which has wavelengths so small they are measured in millimetres. These radio waves can carry huge amounts of data but don’t travel far, which means network builders need to place many small cells close together to use this spectrum. To make the best use of different types of spectrum, networks will include a mix of traditional cell-phone towers and antennas on rooftops (carrying signals over long distances), plus a web of small cells at lower heights (supporting huge bandwidth use over shorter distances). That combination of wireless infrastructure, along with advances in radio technology, will help carriers reduce latency and support billions of devices using more data than ever. Thanks to the web of wireless coverage, users will be able to move around the city without any breaks in service. 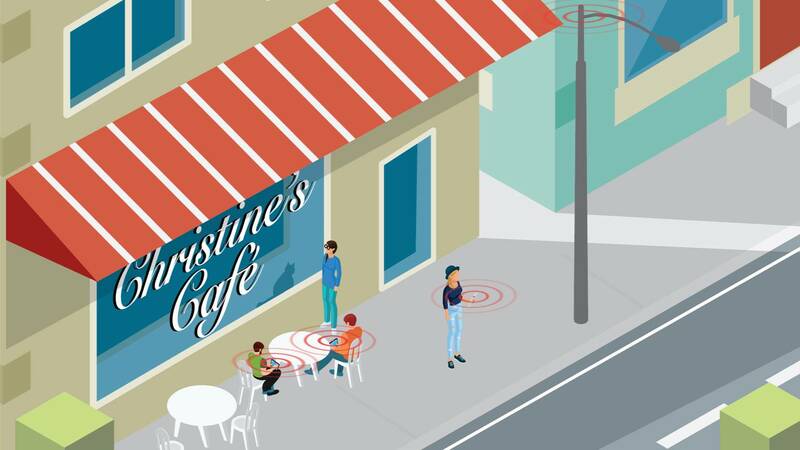 5G networks will also support always-on gadgets, such as health-tracking devices, that depend on constant monitoring. Lower latency and super-high bandwidth will also help enable instant sharing of x-rays and other medical data. Networks will be designed to support more than just personal devices. Smart cities will include a multitude of sensors to control traffic, public transportation, utilities and other public services. Companies will use an expanding array of devices dependent on 5G technology to support increased factory automation, monitoring and tracking on farms, and remote-controlled machinery in mines. Less-populated areas of the city will also benefit from 5G technology, though it will take fewer small cells to serve residents. Downtown and other high-density areas, such as stadiums, will need more small cells to support higher demand on the network. When will 5G become a reality? International bodies are finalizing performance and technical standards, and governments worldwide are consulting on the use of new spectrum frequencies. Major 5G trials are taking place at the Winter Olympics in South Korea, where cameras attached to bobsleds are streaming live video from the point of view of the pilots. The technology is due to be rolled out by the country's wireless carriers next year. In Canada, carriers are running tests and investing in new radio equipment and cell sites, but won’t begin deploying true 5G mobile technology until about 2020. CREDITS: Reporting by CHRISTINE DOBBY; Photography by FRED LUM; Illustrations by JOHN SOPINSKI; Design and development by JEREMY AGIUS; Editing by MATT LUNDY.